The fighting in the Burma Campaign in 1944 was among the most severe in the South-East Asian Theatre of World War II. It took place along the borders between Burma and India, and Burma and China, and involved the British Commonwealth, Chinese and United States forces, against the forces of Imperial Japan and the Indian National Army. British Commonwealth land forces were drawn primarily from the United Kingdom, British India and Africa. The Allies had overcome the logistic and organisational difficulties which had crippled their earlier efforts, and they were preparing to invade Japanese-occupied Burma at several widely separated points. The Japanese forestalled them by launching their own offensive into India, and this offensive became larger in scope than originally intended. By the end of the year, the Allies had achieved significant territorial gains only in one sector, the extreme north-east of Burma, but the Japanese attack on India had been defeated with very heavy casualties. This handicapped the Japanese attempts to defend Burma against renewed Allied offensives in the following year. 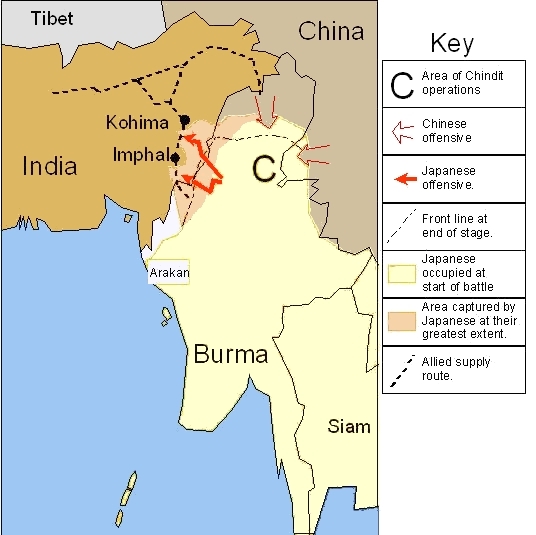 After the Japanese conquest of Burma in early 1942, the Allies had launched tentative counterattacks in late 1942 and early 1943, despite lack of preparation and resources. This resulted in a defeat in the coastal Arakan Province of Burma, and a questionable success in the first Chindit long-range raid into Burma (codenamed Operation Longcloth). The British Fourteenth Army was a multi-national force comprising units from Commonwealth countries during World War II. Many of its units were from the Indian Army as well as British units and there were also significant contributions from West and East African divisions within the British Army. It was often referred to as the "Forgotten Army" because its operations in the Burma Campaign were overlooked by the contemporary press, and remained more obscure than those of the corresponding formations in Europe for long after the war. For most of the Army's existence, it was commanded by Lieutenant-General William Slim. Slim's efforts were aided by improvements to the Allied lines of communication. By October 1944, capacity on the North-East Indian Railways had been raised from 600 tons a day at the start of the war to 4,400 tons a day. 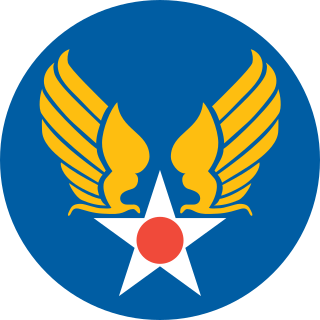 The Allied Eastern Air Command, which consisted mainly of Royal Air Force squadrons but also several units of the Indian Air Force and bomber and transport units of the United States Army Air Forces (USAAF), had gained air superiority and this allowed the Allies to employ new tactics, relying upon air support and aerial resupply of troops. 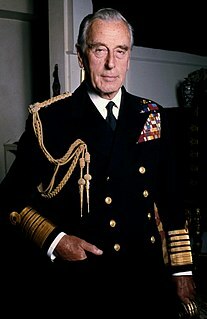 Admiral Mountbatten, as a naval officer who had previously served as commander of Combined Operations HQ, favoured amphibious landings. The first of these was to be on the Andaman Islands (Operation "Buccaneer"), but the landing craft assigned to the operation were recalled to Europe in preparation for the Normandy Landings. The previous year, a British attack into the Burmese coastal province of Arakan had been heavily defeated. Having been reorganised, XV Corps had taken over this part of the front and was preparing to renew the offensive with the aim of capturing Akyab Island, important for its port and airfield. A limited amphibious move (Operation "Pigstick") in support of this attack had to be abandoned for lack of the necessary landing craft and other shipping. The XV Corps was a corps-sized formation of the British Indian Army, which was formed in India during World War II. It took part in the Burma Campaign and was disbanded after the end of the war. The American aim in the China Burma India Theater was to maintain military aid and supplies to the Republic of China under Chiang Kai-shek, with its wartime capital in Chungking. They had established an air supply route, known as the Hump, over the Himalayas to Kunming in the Chinese province of Yunnan. Some Chinese forces which had retreated into India in early 1942 had been re-equipped and retrained by an American military mission under Lieutenant General Joseph Stilwell, who was also Chief of Staff to Chiang Kai-shek and Deputy Commander of SEAC. Stilwell proposed to construct a new road, the Ledo Road, to link India and China by land, although British leaders were sceptical about the value of this road and the effort devoted to it. By the start of 1944, the new road had reached the far side of the Patkai mountains, and Stilwell was preparing to advance on Kamaing and Myitkyina in northern Burma. Chiang Kai-shek had agreed to mount an offensive across the Salween River into eastern Burma from Yunnan. When the Andaman Island landings were cancelled, he claimed this was a breach of faith and cancelled the Yunnan offensive, although he later reinstated it. Following a long-distance raid (Operation "Longcloth") in 1943 by a long-range penetration force known as the Chindits, British Major-General Orde Wingate had gained approval for the force and its scope of operations to be greatly expanded. This was opposed by Slim and others who felt that this was too great a drain on manpower and resources, but under political pressure from Winston Churchill, Wingate's plans went ahead. The Chindits, designated Indian 3rd Infantry Division for cover purposes, were to assist Stilwell by disrupting the Japanese lines of supply to the northern front. After protracted staff discussions within India and between the Allied staffs and commanders in London, Washington and Chungking, the Allied plans for 1944 were reduced to: the offensive by Stilwell's Chinese troops from Ledo; the Chindit operation in support of Stilwell; the renewed overland attack in Arakan; and a rather ill-defined offensive across the Chindwin River from Imphal in support of the other operations. About the same time that SEAC was established, the Japanese had created a new headquarters, Burma Area Army, commanded by Lieutenant General Masakazu Kawabe. Its subordinate formations were the Japanese Fifteenth Army in the north and east of Burma and the Japanese Twenty-Eighth Army in the south and west. By chance or design, the new commander of Fifteenth Army, Lieutenant General Renya Mutaguchi, had played a major part in many recent Japanese triumphs. He had for example been the officer immediately concerned in the Marco Polo Bridge Incident in 1937, which started hostilities between Japan and China, and stated his belief that it was his destiny to win the war for Japan. He was keen to mount an offensive against India. Burma Area Army originally quashed this idea, but Mutaguchi's persistent advocacy won over officers at Southern Expeditionary Army Group at Singapore, the HQ of all Japanese forces in southern Asia. Finally, Imperial General Headquarters in Tokyo approved Mutaguchi's plan. Officers who opposed Mutaguchi's plans were transferred or sidelined. Neither Kawabe, nor Field Marshal Hisaichi Terauchi, the commander in chief of Southern Expeditionary Army Group, were given any opportunity to veto Mutaguchi's plan, or to control the operation once it had started. Stilwell's forces, the Northern Combat Area Command, initially consisted of two American-equipped Chinese divisions, with a Chinese-manned M3 Light Tank battalion and an American long-range penetration brigade known after its commander as "Merrill's Marauders". Three Chinese divisions were later flown from Yunnan to Ledo to reinforce Stilwell. In October 1943 the Chinese 38th Division, led by Sun Li-jen, began to advance from Ledo towards Shinbwiyang, while American engineers and Indian labourers extended the Ledo Road behind them. The Japanese 18th Division advanced to the Chindwin to stop them, but found itself outmatched. Whenever the Chinese 22nd and 38th Divisions ran into Japanese strong points, the Marauders were used to outflank Japanese positions by going through the jungle. A technique which had served the Japanese so well earlier in the war before the Allies had learnt the arts of jungle warfare was now being used against them. At Walawbum, for example, if the Chinese 38th Division had been a little swifter and linked up with the Marauders it could have encircled the Japanese 18th Division. Not only were the Japanese driven back, but the Allies were able to use the trace of the track the Japanese had constructed to supply 18th Division, to speed their construction of the Ledo Road. In Operation Thursday the Chindits were to support Stilwell's advance by interdicting Japanese supply lines in the region of Indaw. On 5 February 1944, Brigadier Bernard Fergusson's 16th Brigade set out from Ledo, on foot. They crossed exceptionally difficult terrain which the Japanese had not guarded, and penetrated the Japanese rear areas. In early March, three other brigades were flown into landing zones behind Japanese lines by the USAAF 1st Air Commando Group, from where they established strongholds on most of the Japanese road and rail links to their northern front. Over the next two and a half months the Chindits were involved in many very heavy contacts with the Japanese. Brigadier Michael Calvert's 77th Brigade successfully defended one of the landing zones, codenamed "Broadway", and established a road and railway block at Mawlu, north of Indaw. This position, codenamed the "White City", was successfully held for several weeks. Not all communications to the Japanese northern front were blocked, as only a single Chindit battalion operated against the road from Bhamo to Myitkyina, beyond the range of effective Allied air support. On 24 March, Fergusson's brigade attempted to capture the airfield at Indaw but was repulsed, following which the exhausted brigade was withdrawn to India. On the same day, Wingate, the commander of the Chindits, was killed in an aircrash. His replacement was Brigadier Joe Lentaigne, formerly the commander of the 111th Brigade, one of the Chindit formations. On 17 May, overall control of the Chindits was transferred from Slim's Fourteenth Army to Stilwell's NCAC. The Chindits evacuated "Broadway" and the "White City", and moved from the Japanese rear areas to new bases closer to Stilwell's front. They were given additional tasks for which they were not equipped. At the same time, the Japanese replaced the scratch "Take Force" which had been trying to defend their rear areas with the newly formed headquarters of the Japanese Thirty-Third Army, and deployed 53rd Division against the Chindits. The 111th Brigade, now commanded by John Masters, tried to establish another road and rail block codenamed "Blackpool" near Hopin, but were forced to retreat after 17 days of battle. The monsoon had broken, making movement difficult and preventing the other Chindit formations reinforcing Masters's brigade. Calvert's 77th Brigade captured Mogaung after a siege which ended on 27 June, but at the cost of 50 percent casualties. By July, it was clear that the Chindits were exhausted by continuous marching and fighting under heavy monsoon rains, and were withdrawn. By the end of the campaign the Chindits had lost 1,396 killed and 2,434 wounded. Over half the remainder had to be hospitalised with a special diet afterwards. 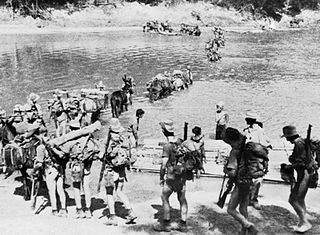 The British 36th Division was transferred from the Arakan to Stilwell's command to replace the Chindits. The Chinese forces on the Yunnan front mounted an attack starting in the second half of April, with nearly 40,000 troops crossing the Salween River on a 200-mile (320 km) front. Within a few days some twelve Chinese Divisions, totalling 72,000 men under the command of General Wei Lihuang, were attacking the Japanese 56th Division. The Japanese forces in the North were now fighting on two fronts, against the Allies from the North West and the Nationalist Chinese from the North East. While the Japanese offensive on the Central Front was being waged, Stilwell's forces continued to make gains. On 19 May, the Chinese 22nd and 38th Divisions encircled Kamaing. Two days before, on 17 May, Merrill's forces captured the airfield at Myitkyina after a march across the Kumon Bum Mountains which nearly crippled the already weary Marauders. If Chinese troops from Ledo had been flown in that afternoon to attack the town immediately they could have overwhelmed the small garrison, but support and logistic units were flown in first and the opportunity to capture the town easily was lost, as Japanese reinforcements arrived in the town. The resulting prolonged siege was not very well directed and cost the allies many men, particularly amongst the Marauders who were kept in the line for reasons of American prestige, and among the Chindits who were forced to remain in the field to disrupt Japanese relief attempts far longer than had been planned. However, because of the deteriorating situation on the other fronts, the Japanese never regained the initiative on the Northern Front. The capture of Myitkyina marked the end of the initial phase of Stilwell's campaign. It was the largest seizure of Japanese-held territory to date in the Burma campaign. The airfield at Myitkyina became a vital link in the air route over the Hump. In Arakan, XV Corps, commanded by Lieutenant General Philip Christison, renewed the advance on the Mayu peninsula. Ranges of steep hills channelled the advance into three attacks; by 5th Indian Division along the coast, 7th Indian Division along the Kalapanzin River and 81st (West Africa) Division along the Kaladan River. The 5th Indian Division captured the small port of Maungdaw on 9 January 1944. The Corps then prepared to capture two disused railway tunnels which linked Maungdaw with the Kalapanzin valley. However, the Japanese struck first. A strong force from the Japanese 55th Division infiltrated Allied lines to attack the 7th Indian Division from the rear, overrunning the divisional HQ. Unlike previous occasions on which this had happened, the Allied forces stood firm against the attack, and supplies were dropped to them by parachute. In the Battle of the Admin Box from 5 February to 23 February, the Japanese concentrated on XV Corps' Administrative Area, defended mainly by service troops, but they were unable to deal with tanks supporting the defenders. Troops from 5th Indian Division broke through the Ngakyedauk Pass to relieve the defenders of the box. Although battle casualties were approximately equal, the overall result was a heavy Japanese defeat. Their infiltration and encirclement tactics had failed to panic Allied troops, and as the Japanese were unable to capture enemy supplies, they themselves starved. Two fresh Allied divisions (the 26th Indian Division and the British 36th Division) took over the front in the Mayu peninsula and resumed the offensive. However, XV Corps's offensive wound down over the next few weeks, as the Allies concentrated their resources, particularly transport aircraft, on the Central Front. After capturing the railway tunnels and some hills which dominated the Maungdaw-Buthidaung road, XV Corps halted during the monsoon. Some ground in the malarial Kalapanzin valley was given up to reduce losses to disease, and Japanese counter-attacks forced the isolated 81st (West Africa) Division to retreat up the Kaladan Valley. At Imphal, IV Corps under Lieutenant-General Geoffrey Scoones had pushed forward two divisions to the Chindwin River. One division was in reserve at Imphal. There were indications that a major Japanese offensive was building, and Slim and Scoones planned to withdraw and force the Japanese to fight at the end of impossibly long and difficult supply lines. However, they misjudged the date on which the Japanese were to attack, and the strength they would use against some objectives. The main body of the Japanese Fifteenth Army, consisting of the 33rd Division, 15th Division and the brigade-sized "Yamamoto Force", planned to cut off and destroy the forward divisions of IV Corps before capturing Imphal. The 31st Division would meanwhile isolate Imphal by capturing Kohima. Mutaguchi intended to exploit this victory by capturing the strategic city of Dimapur, in the Brahmaputra River valley. If this could be achieved, his army would be through the mountainous border region and the whole of North East India would be open to attack. Units of the Indian National Army were to take part in the offensive and raise rebellion in India. The capture of the Dimapur railhead would also sever the land communications to the airbases used to supply the Chinese via the "Hump", and cut off supplies to General Stilwell's forces fighting on the Northern Front. The Japanese began crossing the Chindwin River on 8 March. Scoones only gave his forward divisions orders to withdraw to Imphal on 13 March. The 20th Indian Division withdrew from Tamu without difficulty, but the 17th Indian Division was cut off at Tiddim by the Japanese 33rd Division. From 18 March to 25 March, the 17th Division was able to fight its way back through four Japanese road blocks, thanks to air re-supply by the RAF and U.S Troop Carrier Command crews in their Douglas C-47 Skytrains, and assistance from Scoones's reserve, the 23rd Indian Division. The two divisions reached the Imphal plain on 4 April. Meanwhile, Imphal had been left vulnerable to the Japanese 15th Division. The only force left covering the northern approaches to the base, 50th Indian Parachute Brigade, was roughly handled at the Battle of Sangshak and forced to withdraw by a regiment from the Japanese 31st Division on its way to Kohima. However, the diversionary attack launched by Japanese 55th division in Arakan had already been defeated, and in late March Slim was able to move the battle-hardened 5th Indian Division, with all its artillery, jeeps, mules and other materiel, by air from Arakan to the Central Front. The move was completed in only eleven days. The division's HQ and two brigades went to Imphal, the other brigade (the 161st Indian Infantry Brigade) went to Dimapur from where it sent a detachment to Kohima. While the Allied forces in Imphal were cut off and besieged, the Japanese 31st Division, consisting of 20,000 men under Lieutenant-General Kotoku Sato, advanced up the Imphal–Dimapur road. Instead of isolating the small garrison at Kohima and pressing on with his main force to Dimapur, Sato chose to concentrate on capturing the hill station. The Japanese records indicate that Sato (and Mutaguchi's other divisional commanders) had severe misgivings about Fifteenth Army's plan. In particular, they thought the logistic gambles were reckless, and were unwilling to drive on objectives they thought unattainable. The Battle of Kohima started on 6 April when the Japanese isolated the garrison and tried to dislodge the defenders from their hill top redoubts. Fighting was very heavy around the bungalow and tennis court of the Deputy Commissioner of the Naga Hills. This phase of the battle is often referred to as the Battle of the Tennis Court and was the "high-water mark" of the Japanese attack. On 18 April, the 161st Indian Brigade relieved the defenders, but the battle was not over as the Japanese dug in and defended the positions they had captured. A new Allied formation HQ, the XXXIII Corps under Lieutenant-General Montagu Stopford, took over operations on this front. The British 2nd Division began a counter-offensive and by 15 May, they had prised the Japanese off Kohima Ridge itself, although the Japanese still held dominating positions north and south of the Ridge. More Allied troops were arriving at Kohima. The 7th Indian Division followed 5th Indian Division from the Arakan, an Indian motor infantry brigade reinforced 2nd Division and a brigade diverted from the Chindit operation cut Japanese 31st Division's supply lines. XXXIII Corps renewed its offensive in the middle of May. Men of the 1st Battalion, Devonshire Regiment, part of the 80th Indian Infantry Brigade of the 20th Indian Infantry Division, with Japanese flags captured at Nippon Ridge during the Battle of Imphal-Kohima. The Battle of Imphal went badly for the Japanese during April, as their attacks from several directions on the Imphal plain failed to break the Allied defensive ring. The fighting took place in three main sectors. The Japanese 15th Division's attacks from the north were broken when infantry from the 5th Indian Division and M3 Lee tanks recaptured a vital hill at Nungshigum, which overlooked the main airstrip at Imphal, on 13 April. Fighting between Yamamoto Force and the reduced 20th Indian Division swayed back and forth through the hills on either side of the main Imphal-Tamu road throughout the month. The Japanese 33rd Division was slow to throw in its main attack from the south but there was severe fighting around the village of Bishenpur for several weeks. At the start of May, Slim and Scoones began a counter-offensive against the Japanese 15th Division north of Imphal. Progress was slow. The monsoon had broken, making movement very difficult. Also, IV Corps was suffering some shortages. Although rations and reinforcements were delivered to Imphal by air, artillery ammunition was running short. However, the Japanese were at the end of their endurance. Neither their 31st Division nor 15th Division had received adequate supplies since the offensive began, and during the rains, disease rapidly spread among the starving Japanese troops. Lieutenant-General Sato had notified Mutaguchi that his division would withdraw from Kohima at the end of May if it were not supplied. In spite of orders to hold on, Sato did indeed begin to retreat, although an independent detachment from his division continued to fight delaying actions along the Imphal Road. Meanwhile, the units of 15th Division were wandering away from their positions to forage for supplies. Its commander, Lieutenant-General Masafumi Yamauchi (who was mortally ill), was dismissed but this could not affect matters. The leading British and Indian troops of IV Corps and XXXIII Corps met at Milestone 109 on the Dimapur-Imphal road on 22 June, and the siege of Imphal was raised. Mutaguchi (and Kawabe) nevertheless continued to order renewed attacks. 33rd Division (under a new forceful commander, Lieutenant-General Nobuo Tanaka), and Yamamoto Force made repeated efforts south of Imphal, but by the end of June they had suffered so many casualties both from battle and disease that they were unable to make any progress. The Allies had in the meantime cleared large numbers of starving and disordered Japanese troops in and around Ukhrul (near Sangshak) north of Imphal. The Japanese Imphal operation was finally broken off early in July, and they retreated painfully to the Chindwin River. The attempted invasion of India was the largest defeat to that date in Japanese history. They had suffered 55,000 casualties, including 13,500 dead. Most of these losses were the result of disease, malnutrition and exhaustion. The Allies suffered 17,500 casualties. Mutaguchi was relieved of his command and left Burma for Singapore in disgrace. Sato refused to commit Seppuku (hara-kiri) when handed a sword by Colonel Shumei Kinoshita, insisting that the defeat had not been his doing. He was examined by doctors who stated that his mental health was such that he could not be court-martialled, probably under pressure from Kawabe and Terauchi, who did not wish a public scandal. From August to November, Fourteenth Army pursued the Japanese to the Chindwin River despite heavy monsoon rains. While the newly arrived 11th East Africa Division advanced down the Kabaw Valley from Tamu and improved the road behind them, the 5th Indian Division advanced along the mountainous Tiddim road. As Fourteenth Army planned to use only the Kabaw Valley route for supply during the next season's campaign, the Tiddim Road (which included evocatively named stretches such as the "Chocolate Staircase") was allowed to fall into ruin behind the 5th Division, which was supplied entirely by parachute drops. An improvised light formation, the Lushai Brigade, was used to interrupt the lines of communication of the Japanese defending the road. By the end of November, Kalewa (an important river port on the Chindwin) had been recaptured, and several bridgeheads had been established on the east bank of the Chindwin. Slim and his Corps commanders (Scoones, Christison and Stopford) were knighted in front of Scottish, Gurkha and Punjab regiments by the viceroy Lord Wavell in a ceremony at Imphal in December. The Chindits, known officially as the Long Range Penetration Groups, were special operations units of the British and Indian armies, which saw action in 1943–1944, during the Burma Campaign of World War II. The creation of British Army Brigadier Orde Charles Wingate, the Chindits were formed for raiding operations against the Imperial Japanese Army, especially long-range penetration: attacking Japanese troops, facilities and lines of communication, deep behind Japanese lines. 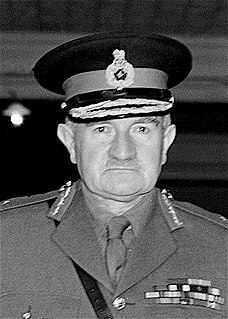 Field Marshal William Joseph Slim, 1st Viscount Slim,, usually known as Bill Slim, was a British military commander and the 13th Governor-General of Australia. The Northern Combat Area Command or NCAC was a subcommand of the Allied South East Asia Command (SEAC) during World War II. It controlled Allied ground operations in northern Burma. For most of its existence NCAC was commanded by US Army General Joseph "Vinegar Joe" Stilwell. In 1945 after Stilwell was recalled, his deputy, Lieutenant General Daniel Sultan, was promoted to and assumed command. 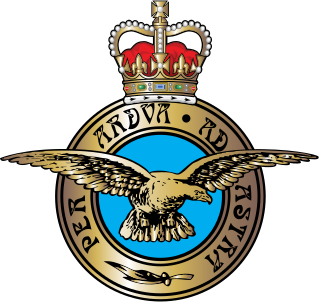 V Force was a reconnaissance, intelligence-gathering and guerrilla organisation established by the British against Japanese forces during the Burma Campaign in World War II. General Sir Montagu George North Stopford was a senior British Army officer who fought during both World War I and World War II. The latter he served in with distinction, commanding XXXIII Indian Corps in the Far East, where he served under Field Marshal Sir William Slim, and played a significant role in the Burma Campaign, specifically during the Battle of Kohima in mid-1944. Kōtoku Satō was a lieutenant general in the Imperial Japanese Army in World War II. The 33rd Division was an infantry division of the Imperial Japanese Army. Its call sign was the Bow Division. The 33rd Division was raised in Utsunomiya, Tochigi prefecture, simultaneously with 32nd, 34th, 35th, 36th and 37th Divisions. Its headquarters were initially in Sendai. It was raised from conscripts largely from the northern Kantō prefectures of Tochigi, Ibaraki and Gunma. The 31st Division was an infantry division of the Imperial Japanese Army. Its call sign was the Furious Division. 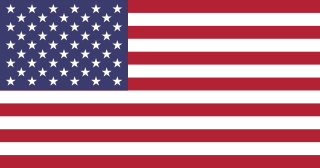 The 31st Division was raised during World War II in Bangkok, Thailand, on March 22, 1943, out of Kawaguchi Detachment and parts of the 13th, 40th and 116th divisions. The 31st division was initially assigned to 15th army. The Battles and Operations involving the Indian National Army during World War II were all fought in the South-East Asian theatre. These range from the earliest deployments of the INA's preceding units in espionage during Malayan Campaign in 1942, through the more substantial commitments during the Japanese Ha Go and U Go offensives in the Upper Burma and Manipur region, to the defensive battles during the Allied Burma Campaign. The INA's brother unit in Europe, the Indische Legion did not see any substantial deployment although some were engaged in Atlantic wall duties, special operations in Persia and Afghanistan, and later a small deployment in Italy. The INA was not considered a significant military threat. However, it was deemed a significant strategic threat especially to the Indian Army, with Wavell describing it as a target of prime importance. The U Go offensive, or Operation C, was the Japanese offensive launched in March 1944 against forces of the British Empire in the northeast Indian regions of Manipur and the Naga Hills. Aimed at the Brahmaputra valley, through the two towns of Imphal and Kohima, the offensive along with the overlapping Ha Go offensive was one of the last major Japanese offensives during the Second World War. The offensive culminated in the Battles of Imphal and Kohima, where the Japanese and their allies were first held and then pushed back. The Burma Campaign in the South-East Asian Theatre of World War II took place over four years from 1942 to 1945. During the first year of the campaign, the Imperial Japanese Army with aid from Burmese insurgents had driven British forces and Chinese forces out of Burma, and occupied most of the country. From May to December 1942, most active campaigning ceased as the monsoon rains made tactical movement almost impossible in the forested and mountainous border between India and Burma, and both the Allies and Japanese faced severe logistical constraints. The Japanese 15th Army was an army of the Imperial Japanese Army during World War II. It was involved in the invasion of Burma in December 1941 and served in that country for most of its war service. The Burma Campaign in the South-East Asian Theatre of World War II was fought primarily by British Commonwealth, Chinese and United States forces against the forces of Imperial Japan, who were assisted to some degree by Thailand, the Burmese Independence Army and the Indian National Army. The British Commonwealth land forces were drawn primarily from the United Kingdom, British India and Africa. The British Indian XXXIII Corps was a corps-sized formation of the Indian Army during World War II. It was disbanded and the headquarters was recreated as an Army headquarters in 1945. McLynn, Frank (2011). The Burma Campaign: Disaster Into Triumph, 1942–45. Yale University Press. ISBN 9780300171624.